A man who demanded a lift home from firefighters smashed a fire engine window when they refused. The man, who crews believe had been drinking, claimed he was entitled to be driven home as a public service. Firefighters had been responding to a separate emergency call in Lowestoft, Suffolk, when the man attacked the vehicle in the early hours on Saturday. Lowestoft station commander Russell Punchard said the man's behaviour was "atrocious". "Unfortunately it's a reflection of the society we live in today," he said. "There are more and more attacks going on nationally towards all emergency services, and the fire service is not exempt. "Quite clearly on the front it says 'fire' and not 'taxi'." The crew from Lowestoft South had been responding to a false alarm at a care home in Wensum Gardens when the man approached them on Heigham Drive, Kirkley. Firefighter Ben Horne said he was told by the crew on duty that the man had demanded a lift home because he was injured. "He said they weren't serving the public and he was a member of the public," he said. The man then punched the window, causing the reinforced glass to crack. 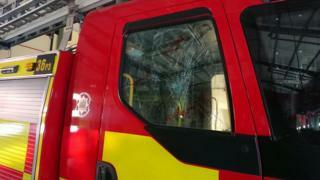 The fire engine is still in use but the window will need repairs estimated to cost about £500. Suffolk Police confirmed the fire service had called them at about 01:20 GMT, and inquiry was ongoing and they were appealing for information.